↑ Germplasm Resources Information Network (GRIN) (1997-07-11). 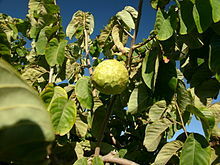 "Taxon: Annona cherimola L." Taxonomy for Plants. USDA, ARS, National Genetic Resources Program, National Germplasm Resources Laboratory, Beltsville, Maryland. สืบค้นเมื่อ 2008-04-17. ↑ van Zonneveld M, Scheldeman X, Escribano P, Viruel MA, Van Damme P, et al. 2012 Mapping Genetic Diversity of Cherimoya (Annona cherimola Mill. ): Application of Spatial Analysis for Conservation and Use of Plant Genetic Resources. PLoS ONE 7(1): e29845. ↑ "COUNCIL REGULATION (EC) No 510/2006 'CHIRIMOYA DE LA COSTA TROPICAL DE GRANADA-MÁLAGA'". EU DOOR. สืบค้นเมื่อ 24 March 2014. หน้านี้แก้ไขล่าสุดเมื่อวันที่ 6 พฤศจิกายน 2559 เวลา 21:43 น.